Did you ever learn about marine butterflies in grade-school? Well good, because there is no such thing as a marine butterfly. This elegant-looking critter is a pteropod, a type of gastropod mollusk—in other words, a slug! These mollusks are highly adapted for life in the water-column, as you can see from the butterfly-like wings, (or “parapodia” to a malacologist). The pteropod wings are actually a highly-modified molluskan foot, i.e. the muscular and slime-secreting mass that slugs glide on. Evolution really did these slugs a favor, as I do not think anyone could say “ewww!” to such a beautiful animal. Now this is a fantastic image. 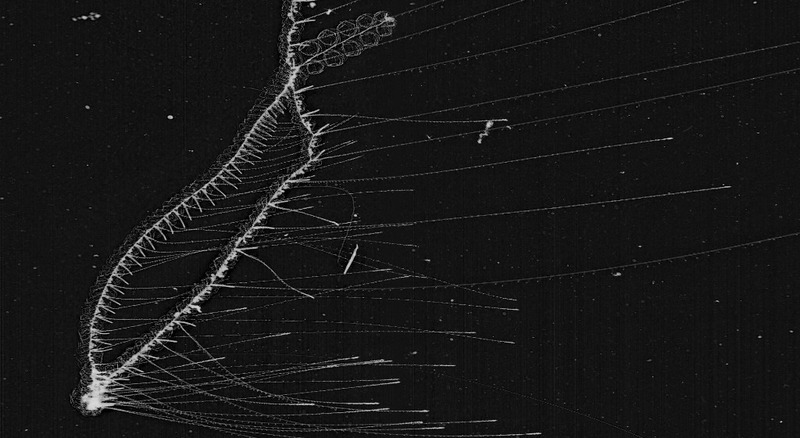 A close-up, finely-detailed capture of the head (nectosome) portion of a calycophoran siphonophore—so aptly referred to as a “rocket-ship sipho” here on the Plankton Portal. The two siphon-like features propelling this colonial critter are very apparent in this image. 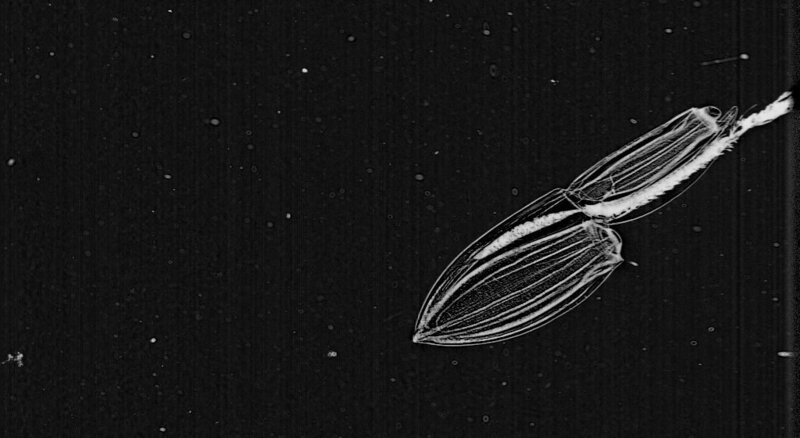 Maybe, in truth, siphon-ophore is a pretty apt name for this plankter as well. 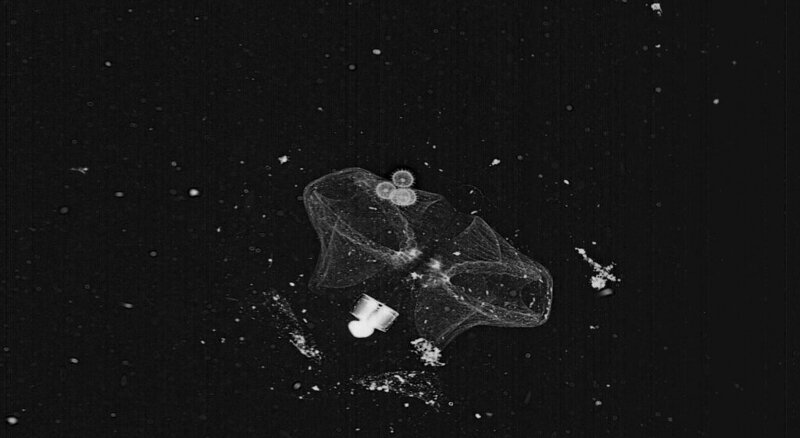 Thalassocalyce inconstans is a predatory species of ctenophore, captured feeding in this frame. The body of the ctenophore is contracted and engorged about the anteroposterior (vertical) axis, giving it the appearance of an inflated, heart-shaped balloon. Within the fragile and transparent body, you can see the 8 condensed comb rows captured as an array of ragged segments crowning the aboral end. Fine mesenterial canals also appear as contoured markings that line the engorged body. Ctenophores are tactile predators, meaning all predatory behavior is triggered by physical, non-visual stimulus. Something in the water column bumped into this Thalasso and got it all riled up, providing ISIIS a great opportunity for this detailed capture of foraging behavior. If we had a hydrophone for this deployment, I am fairly certain a satisfied lip-smacking would be recorded in a few seconds. Copepods: Families Eucalanidae and Metridinidae. Copepods are abundant in these ISIIS data, and it is easy to forget what a broad diversity of these important crustaceans are classified on the site. Here we have two broadly identifiable PP copepods for sample. 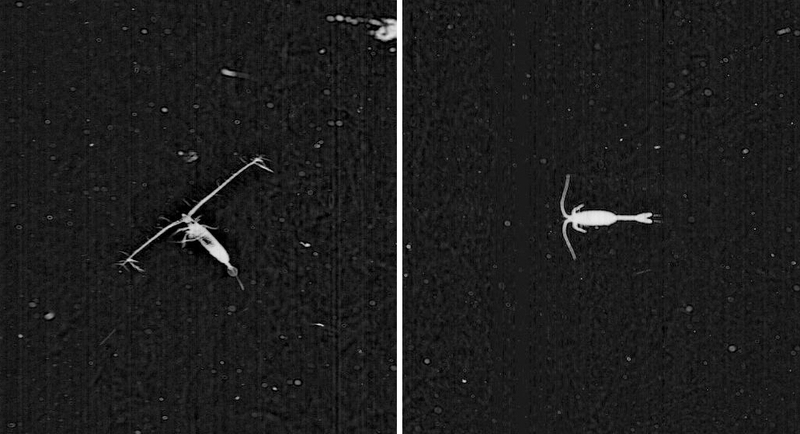 The image on the left shows a copepod belonging to the family Eucalinidae: it has a narrow, torpedo-shaped body and the anterior end of the head forms a pointed-triangle. We think this critter might be a Rhincalanus spp.—if you look close you might be able to make out a small rostrum-like appendage extending forward and tucked down from the head, as well as what may be lateral spination at the end of each mid-body segment (prosome). This guy’s cruising, antennas spread out and scanning the surroundings. On the right, we have a copepod belonging to the family Metridinidae, perfectly poised for the ISIIS cam. How do we guess this ID? At the end of this copepods lengthy tail (urosome), look closely at the paired fin-like feature (ferka). Along the outer edge, right before the separation of the individual ferka, can you make out a small, skirt-like protrusion? If so, just tell your buddies: “hmm, check out that lengthy urosome and ferka segmentation; it must be a Metrinidae species,” and blamo—you are a crustacean taxonomist! At first glance, you might be thinking “is this medusae sticking its tongue out at me?” Or maybe it is sporting a ten-gallon hat? While I couldn’t blame you for such outlandish assertions (I mean, who would write such silly things? ), this odd anthomedusae is readily identified to genus by the conical appendage extending from the bell (“apical process”) and causing much confusion on the Plankton Portal. In this image we get a great view of many internal and external features of this Leukartia sp., including a crenulated (ragged) bell margin, a tall mouth (“manubrium”) in the center of the bell, and many long tentacles projected both downwards and in front of the bell. We find a good deal of larvaceans on the site, but this capture is a real beauty. Larvaceans are gelatinous plankton that filter-feed on detritus in the water column. You see the critter poking its head out, like the cap on a rolled-up toothpaste tube? That’s the larvacean, curled up in preparation to pump surrounding detritus through its elaborate mesh-like mucous house. For a critter that takes up residency in its own secretion, this guy is pretty adorable! Now this is quite the fantastic find! Here we are looking at a large siphonophore projecting numerous tentacles across the frame. It is all-hands-on-deck for this colonial jelly, as it is putting on a mighty foraging display for us. The big guy is hungry—watch out, ISIIS. 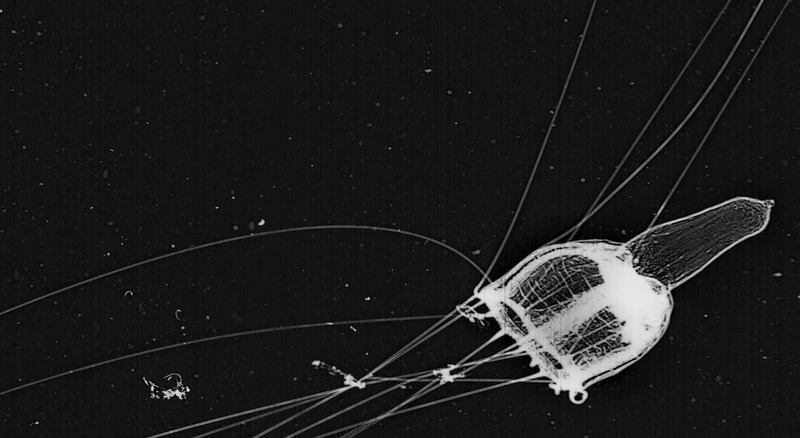 There have been way too many great images to fit in this small serving of photogenic plankton. We look forward to serving up more fantastic finds in the future. Keep exploring, plankton hunters! 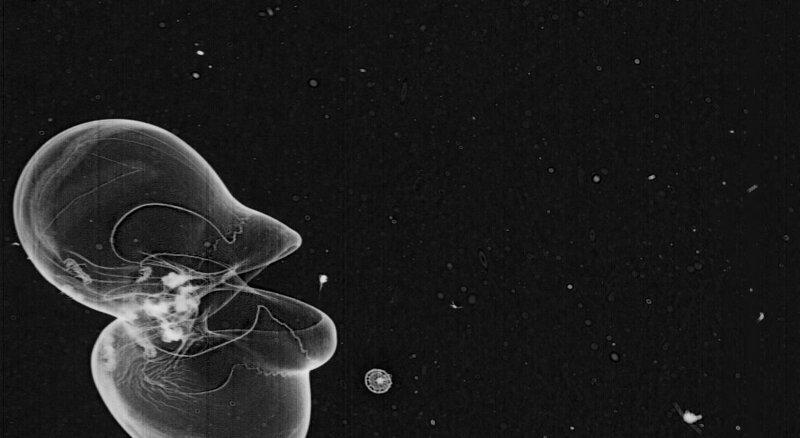 This entry was posted in Fantastic Finds, Plankton, Science and tagged Copepod, ctenophores, FFF, ISIIS, larvaceans, medusae, plankton, plankton portal, rocketship thimble, science, Siphonophore, thalasso by bgrassian. Bookmark the permalink. 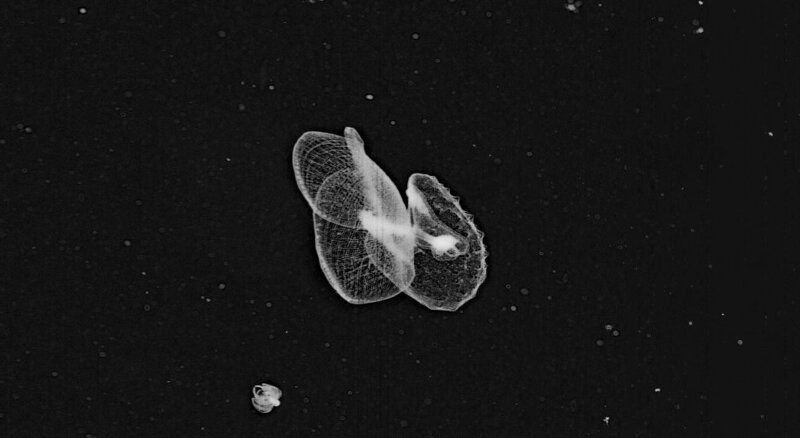 Speaking of our “sea butterflies” – there was a new study recently done on Limacina helicina, a kind of sea butterfly. They found out that the way it “flaps” its wings is by the Weis-Fogh “clap-and-fling” mechanism, which is the same mechanism used by modern insects. Our sea butterflies might be living common ancestors of both gastropods and insects! How cool is that?